My friend Sheila sent me this fun, quickie pattern for a soap bag. 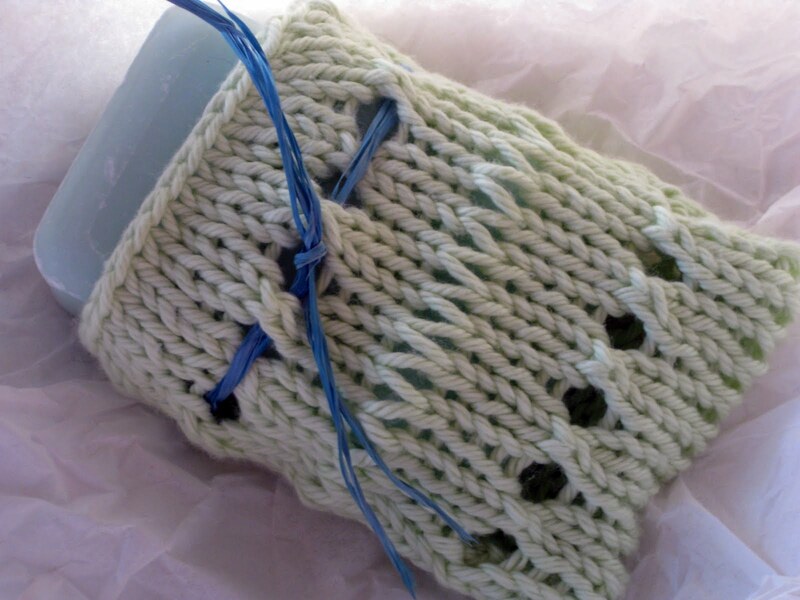 Her niece makes handmade soap and needed a way to enhance her sales, so Sheila designed the sack for her. "The nice thing about the sack," says Sheila, "is if you use a wash cloth or one of those net scrubbies when you shower, you can take the soap sack right in to the shower with you. For children or elderly who have a hard time hanging on to that slippery bar of soap, the sack keeps the soap from slipping out of your fingers. I love the gentle exfoliating as well." I knit Sheila's soap bag last weekend and enjoyed the combination of stockinette, YO's, and drop stitches. Plus I was able to finish the bag in under two hours. The soap I used is E. Barrett & Company French Soap in Ocean and it smells heavenly. Rows 1 - 4: Knit in stockinette. Row 5: *K2TOG, YO* ending with a YO and then knit the last stitch. Rows 7 - 10: Knit in stockinette. Row 11: Knit across row, wrapping each stitch twice around the needle when forming the stitch. Row 12: Purl, dropping each stitch. Repeat these 12 rows two more times. Knit one row *K2TOG, YO* ending with a YO and then knit the last stitch. Starting with a purl row, knit four rows stockinette. Bind off. You will have a total of four YO rows and three drop stitch rows. The third drop stitch row is the bottom of the bag. Seam sides of bag using mattress stitch being careful to line up the YO rows and the drop stitch rows. 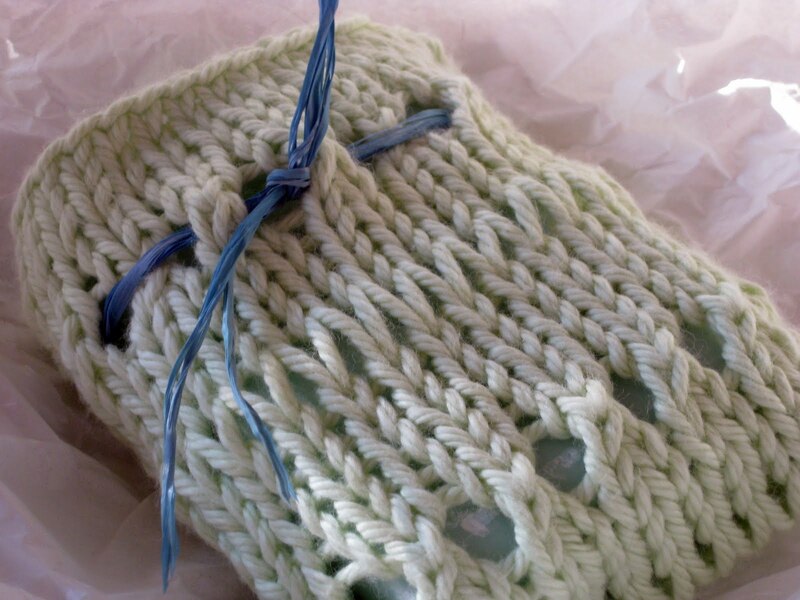 Weave a piece of ribbon, raffia or yarn through the top row of YO's, insert soap and tie the drawstring. If there are any errors in this pattern they are mine, so feel free to let me know in the comments or at stacy@goldenbirdknits.com and I will make corrections. If you would like to talk to Sheila, the designer of the pattern, please contact her at kayteetoo@hotmail.com. This would be lovely in a gift basket along with some handmade soaps. Guess what's next on my needles? Thank you Stacy. PS- I hope everything is well with your Mom and that Lily is happy and healthy. Love this and would make some for my guest bathroom so they can take it home with them. Love it! Great idea to keep the slippery soap from hitting the floor:) Have a blessed Friday my friend, HUGS! What a cute idea! Thanks for sharing the pattern Stacy! Thanks for the pattern. I have printed it off. It will be the perfect project for a hot day. Very very cute. Love the combination of stitches. Ocean soap reminds me of my days working at Coastal Collections. I am still in GV and enjoying the cooler weather. I have made soap bags before, but I love this pattern. This will be the next thing on my needles. I am making loads of your mini knitting bags. But I am making them much smaller and putting them on a key ring. What a great idea for packaging soap, gift giving, and quick satisfying yarn project for beach blanket knitting. I love this pattern but was wondering, if I use 100% wool yarn, could I felt this? I suspect that would be a waste of all the pretty stitching, huh? I live in Australia and was recently asked by my very sick sister-law if I would knit her a soap bag. I did and made it out of the Chinese Waves pattern for wash/dish cloths. Then I made her the same for her mobile phone but put an extra long cord on it so she could wear around her neck. I am all for making soldiers soap bags! Keep up good work. I love this idea and pattern, was wondering if I can use SIZE 7 CIRCULAR NEEDLES and LION BRAND 100% KITCHEN COTTON YARN? Thank you for the wonderful pattern it's next on my needles for my roomate for christmas. He never knows what to do with the small end of the soap. This will be great he can just put them in the bag and use them that way. You can very well know how.